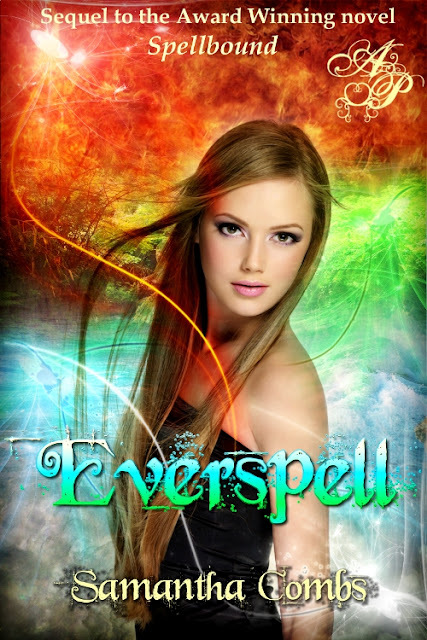 Everspell is the sequel to Spellbound. So after finishing Spellbound, I thought Everspell would be like; whatever, just an extension, BORING. Boy, was I wrong. There were tons of surprises and turns of events, and I certainly cannot wait for the 3 and last book of the series, although I am sad that it's ending. This one definitely deserves a 5 out of 5 book-a-saur paws too! Here is the blurb: Book Two in the Spellbound series continues the love story of Logan and Serena. Having previously dispatched Christophe, the dark demon trying to capture and kidnap Serena for her special witch DNA in Book One, the two lovers believe they are now free to plan and live their lives together. Or are they? After I finished reading the books, I asked Samantha if she would do an interview with me, and she generously said yes. So here it is! Me: Ok, First question. What inspired you to write Spellbound? Samantha: I was actually inspired by my daughter. At the time, she was 4 years old and we were all in the middle of Twilight mania. She kept running around saying she was going to marry Edward the vampire. I wanted to give her a boyfriend model who was a bit more accessible. Or at least the kind I would want her to bring home! That's how Logan was born in my head. Me: How did you come up with the story? Samantha: I knew vampires were being done to death and with my name being the name of a witch, it just seemed a natural segue. Plus, my daughter requested a book about witches. Its REALLY hard to turn down a 4 year old. When I began, it was going to a little story for her. Then it got long enough for chapters. And then I fell just a little in love with Logan. Before I knew it, it was a novel. And a friend of min who was devouring the chapters as they were written, kept telling me it should be a book. And I began to think it could be one. Me: When did you finish Spellbound? Samantha: I started it in February 2010 and finished it in April. Most novels I write take about 2 1/2 months from start to finish. Me: Impressive. Did you feel as though it was completed? Samantha: Thanks. Of course, it needed editing, and I went through it and rearranged some of the chapters. I wasn't at all sure of what I was doing as it was my first novel. I work a little differently now that I have done this a few times. LOL. Eight books in, I have a pretty defined method that works for me. But I never feel as though its completely done. Sometimes I even read the printed version and wince a bit as I realize I could have done this or said this and made it better. But the fans are seeming to enjoy them! Happily! Me: Where you originally going to write a second book? Samantha: You know, I wasn't. I had no plans to do so. But the characters lived with me so long after I finished Spellbound, and frankly, they wouldn't shut up. Conversations kept going in my head and I realized there was so much left to say. That their lives, like any life, would go on. I sat down and wrote a couple paragraphs to see if I was right, and Everspell took on a life of its own. Me: Will there be a book 3? Samantha: There will. I am fleshing out concepts and titles right now. I feel like the book may begin soon. But it will be the final chapter in the lives of Serena and Logan. At least I think it will. LOL. My muse, Musina, often has very different ideas from mine! Me: Are you currently working on any other book? Samantha: I just finished a darker YA novel, which I was lucky to contract already with Secret Cravings Publishing. They intend to release The Deadlies sometime in April and I am DEEP in the polishing process with my editor right now. I am also about 2/3 of the way thru a book I am calling Wingspan, about a girl who learns she is growing wings. It is a much darker, edgy book, and I believe it qualifies as the new genre New Adult as opposed to YA. I hope to finish it in another month or so. And I am always writing my horror shorts. Me: Interesting. When did you start writing? Samantha: Pretty much the same answer as everyone....ever since I can remember. If you asked my Mum, she'd say I'd been writing since I would wield a pencil. I remember writing a poem instead of a book report and I call that the beginning. I was in the 5th grade. Me: What other Genres do you write? Samantha: I write YA paranormal, New Adult and adult horror. Me: What genres do you read? Samantha: I am a huge horror fan and I enjoy edgier paranormals. Something with some killing, please. And psychological thrillers? Oh, yes, yes please. I also enjoy a good legal thriller. Me: And last but not least, Who is your favorite author? Samantha: It might sound pedestrian, but it has always been Stephen King. I add others in and they stay a while, until another amazing writer is born. I like Sarah Dessen and James Patterson and David Balducci and Dean Koontz. And I have special places in my heart for Judy Blume and Isaac Asimov. Me: Great! Thank you Samantha. Samantha: Thanks Alex. This was really fun. Would you like to know more about her? Check it out! Samantha Combs is a Southern California author with eight published books: Her Young Adult paranormal titles, the Global Ebook Award-winning debut title SPELLBOUND, SPELLBOUND's sequel, EVERSPELL, GHOSTLY, and WATERDANCER, a middle grade horror called THE DETENTION DEMON, and her adult horror collections, TEETH AND TALONS and WAY PAST MIDNIGHT. HELLOWEEN is her eighth book and her third horror story collection. She enjoys writing YA paranormals, both dark and light, and supernatural fantasy and romance, but it is her love of horror that started it all. Thanks, Mr. King.